I never go out without my camera, well, almost never!!! You never know when a photo op will present itself!! 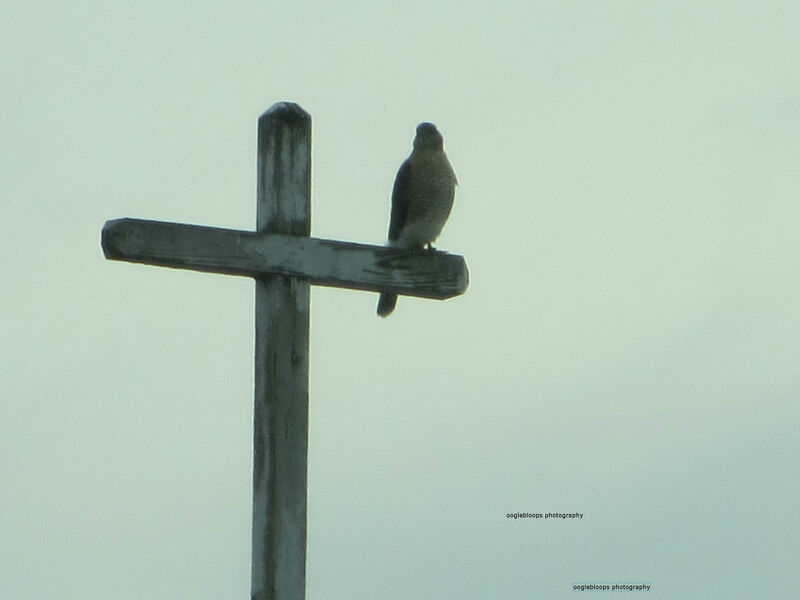 I was sitting in line at the bank drive thru’ the other day, and noticed a hawk sitting atop an old church across the way. This old church has been the subject of mine before – its decaying bell tower has become a home for the local pigeons. No doubt, the hawk is aware of this, and has assumed his post on the cross, in hopes of a meal trying to sneak by him. The pigeons are hiding out! I took a few photos thru’ my dusty windshield, until I was able to get thru’ the long bank line and park across the street from the church. I did not dare get out of the car, these hawks don’t appreciate human presence, and tend to fly off. I don’t have the best camera, so my zoom lens is not the greatest. Plus, the sun , altho’ behind clouds, was directly behind the hawk. It is what it is – I was just happy to see him there, and that he hung out long enough for me to snap a few pics!! !